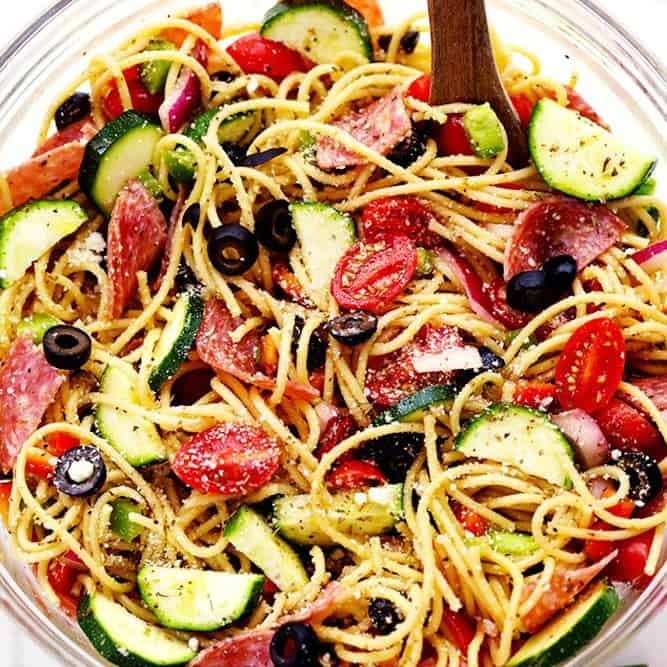 Italian Spaghetti Salad is made with spaghetti, fresh summer veggies, salami and tossed in a homemade zesty italian dressing. This is a summer potluck must! Summer is starting to come to an end. I am not to sure how I feel about it. Even though I am ready for the crisp fall air and leaves, there are so many things I will miss about the summer time. Swimming at the pool almost every day and summer BBQ’s and potlucks will be hugely missed. 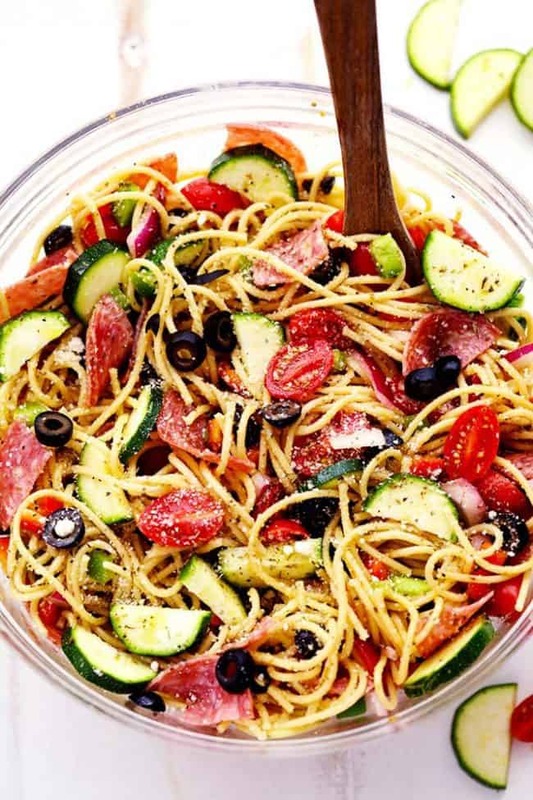 I have this California Spaghetti Salad on the the blog that is my most popular summer recipe. It is a must to take to a potluck and it is the first thing that I can’t wave to dive into. 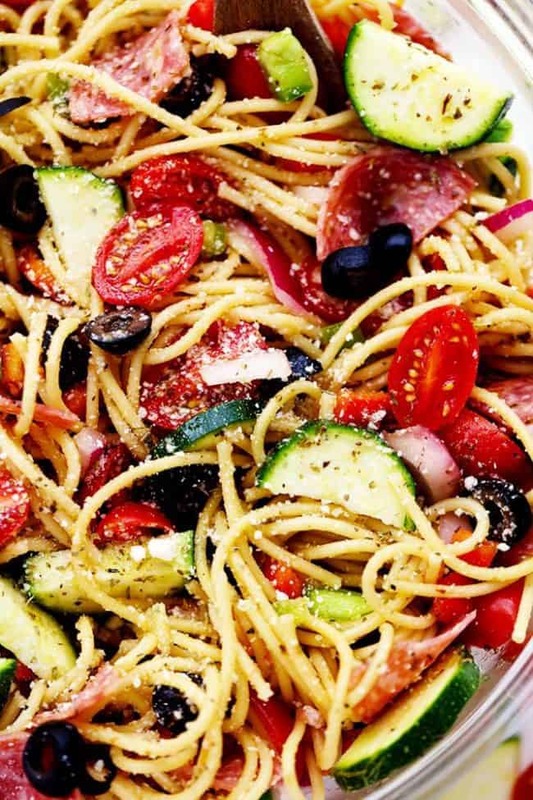 Something about the spaghetti and fresh summer veggies tossed in a zesty dressing is awesome. I get comments all of the time wondering if this can be made with a homemade italian dressing. So today I present to you the delicious Italian Spaghetti Salad with homemade dressing. 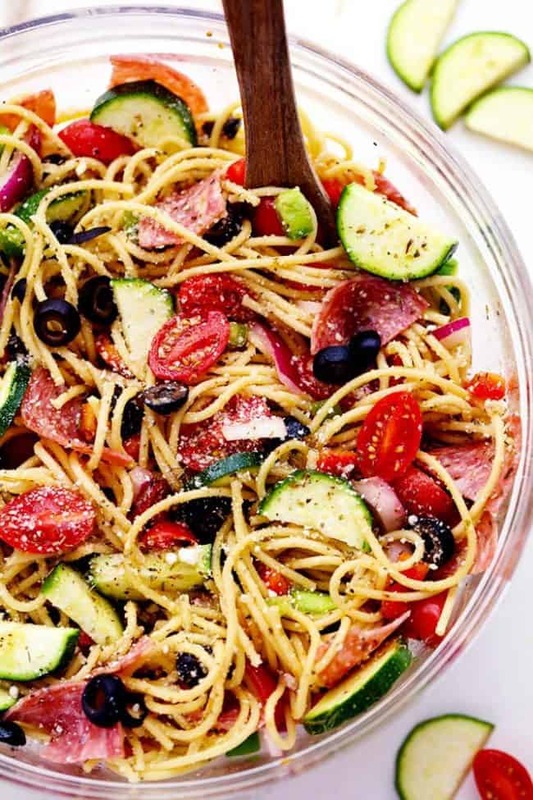 The California Spaghetti Salad is perfect for throwing together in no time at all and using a store bought dressing. 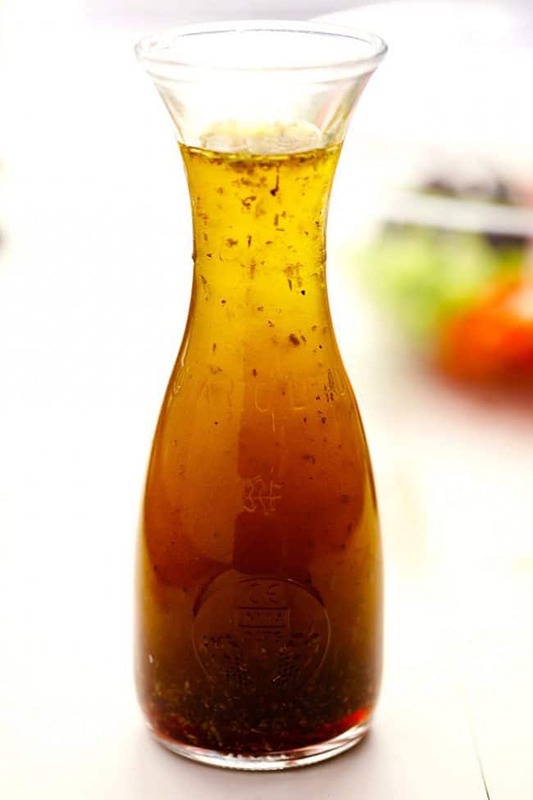 But if you have a few extra minutes to make this homemade dressing, it is amazing! I absolutely love all of the fresh summer veggies in this salad and the vibrant color that it adds. I added some salami to this salad and it was such a delicious addition! If you haven’t made this salad yet, you need to! It is perfect for any gathering and sure to be a huge hit! Cook the pasta according to package directions. Drain and rinse in cold water. 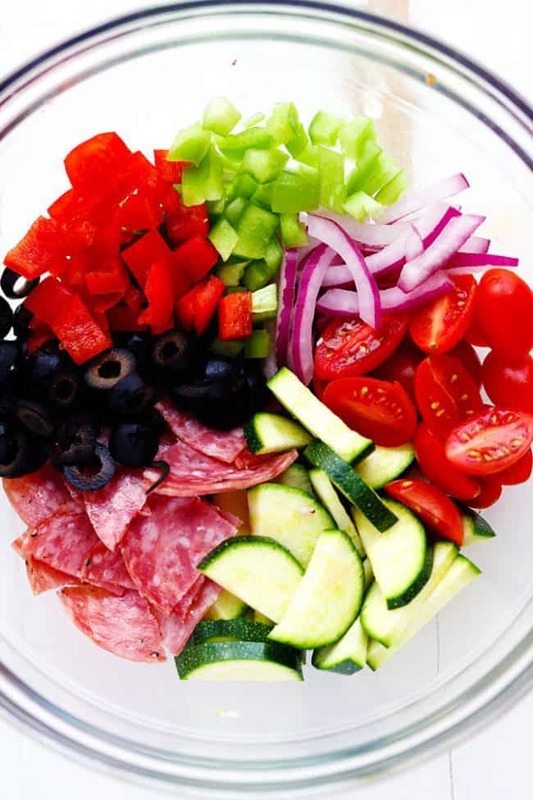 Add cherry tomatoes, zucchini, cucumber, green and red bell pepper, red onions, olives, and salami in a large bowl. To make the dressing: Whisk together in a medium sized bowl olive oil, red wine vinegar, italian seasoning, parmesan cheese, sesame seeds, paprika, celery seed, garlic powder, salt and pepper. Drizzle and toss over the salad. Cover and refrigerate for 3 hours or overnight. I want something fast to prepare or prepared overnight, so that it can be ready quickly in the morning for girls to eat before they rush to college.Spaghetti menu would be fine.Please also guide us how to serve also. This is great, and the dressing is so much better than any in a bottle! I have been making a version of that spaghetti salad for years. Absolutely love it. I do a version of my own Italian dressing. Instead of sugar though I use catsup. It doesn’t change the flavor and still adds a little bit of sweetness, and helps bind the oil and vinegar together.